What do divorce, death in the family and a move abroad have in common? Researchers claim that these three are the most stressful life events a person can experience. What these events have in common is the loss of next of kin or friends. Big changes in one's life can be very difficult. As a Global Mobility Manager or HR Business Partner you are at least partially responsible for the happiness of the expat population. More than one HR person has had to sit down with frustrated and lonely expats. Introverts have a particularly difficult time getting up and running with a new set of friends. This is where you can help. Sharing your knowledge and letting the foreign employee know that things take a bit more time in Northern Europe than in warmer climates where socializing requires less effort and planning. We have talked to many expats and their Swedish colleagues over the years to determine what the winning formulas are. We have also done a number of exit interviews with those who leave Sweden. There certainly seems to be a winning formula with several components. 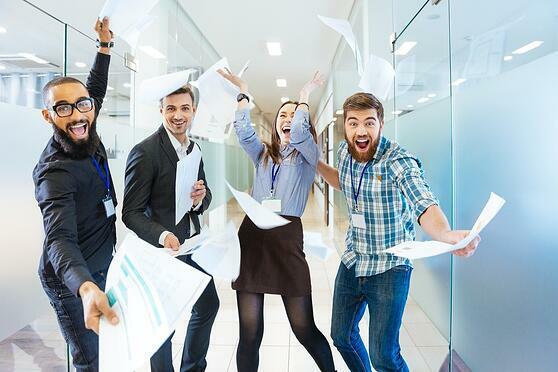 Happy employees who have a great time outside the office will be more productive, and will also stay longer with the company. Many HR experts are daunted by the prospect of feeling responsible for the happiness of new employees in their free time. They are already spending a lot of energy on creating a wonderful workplace for employees. Here are some easy happiness life hacks that you can spread around the office. These ideas will benefit your whole office not just your new hire — a win-win for everyone. Begin by being a stellar role model yourself. Always say hello to people in the office, but why not start outside. Say hello to everyone in your building, block and neighborhood around your office. You will see how it creates new friendships and spreads cheer and good will. Give at least one compliment per day. Keep track. Check in on at least one expat per day. Eat lunch with a new colleague in the office each week or as a minimum make sure someone else does. Plus One. (I love this one!) Next time you go to a coffee shop, lunch, have a dinner party, or go for a walk, ask at least one more person to join or ask the persons/s you are meeting to bring someone. Soon you will have a far bigger network. Try it so you can tell your expats how it worked for you. Here’s the FB experiment from The Happiness Research Institute. Can you get people in your office to join you in a week-long experiment? It is so sad to see a table full of people eating lunch or even dinner with their phones out. No wonder we are not super happy. The fake connections over a device can't trump a real live conversation. You will need critical mass for this experiment to work though. Being the only one not on a device, if everyone else is, could make you feel a little odd. If you want to create a NO PHONE zone in the kitchen at work you may need some back up arguments to promote this. Take a look at what Simon Sinek says on dopamine levels. There is a great talk on YouTube you can find here. It is part of the health responsibility of the employer to inform and encourage less phone use at least in the office. Do you think it will be easier for your expats to strike up a conversation and perhaps friendships with colleagues if eating together with their full focus on the people actually in the room? I think so and it will cultivate a real interest for one another and understanding and curiosity for others. It is far easier to work well together if there is a bit of a connection gained from small conversations and true engagement. How about having a challenge in the office with “Find free fun” and post it with encouragement to do it together. Free movies, free evenings at selected museums, and openings. You want to make sure that no one is excluded because they are saving for the downpayment in the Swedish housing market! Joint experiences rank a lot higher on the happiness index than consumption. Encourage your expat to join our private Facebook group for expats in Sweden where they can ask questions and get help and advice from other expats. We have found that a strong expat community can mean the world to a newcomer in Sweden. Here is the link to the Facebook group called Successful Expats in Sweden. Lastly, feel free to offer your expat our complimentary online course which will help them understand Swedish office culture and give them loads of tips on how to succeed in their new job. You can take a look at it here. If you have an questions on immigration to Sweden, feel free to reach out to us for a free consultation.